Hand deployment of PRR-800 radiometer.PRR-800 and PRR-2600 systems combine precision radiance and irradiance optics, high-performance data acquisition systems, and surface-mount electronics in a compact, rugged design. The PRR-800 is a 15–19 waveband, SeaWiFS-compliant reflectance radiometer. The less-expensive PRR-2600 is equipped with 8 reflectance wavebands. 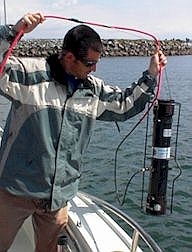 The instrument is intended to be lowered by hand from a vessel, supported from its own data cable, with the output from the sensors available in real time on a Microsoft Windows compatible computer. Accessories, such as lowering frame, free-fall system, and underwater shielded Kevlar cable, must be ordered separately. 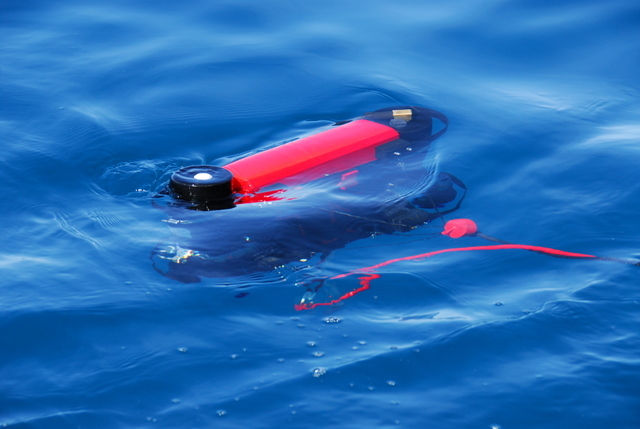 A typical PRR system would include both the submersible PRR, a radiometrically matching surface reference sensor (810 or 2610), deployment system (frame or free-fall), cables, and battery powered deckbox (included with PRR). An entire system can be battery-powered, assuming that the required PC is also battery-powered. 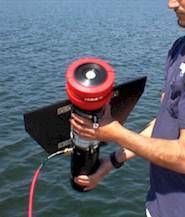 The PRR-800's small size (10 cm x 56 cm) minimizes shadow and allows the instrument to be hand-deployed from a vessel as small as an outboard-powered inflatable. This versatile instrument can be equipped for traditional vertical profiling using a lowering frame or in free-fall mode away from the ship using a syntactic foam collar, thereby avoiding ship shadows. The instrument is also available in an optional split configuration for use in turbid coastal regions. The split PRR-800 configuration separates the Lu and Ed heads and orients them on a special lowering frame so that the detector plates are aligned on a horizontal plane. This configuration is intended for turbid water applications where minimal distance between heads is desirable. The PRR-800's modular design also allows daisy-chaining multiple instrument heads to achieve hyper-spectral resolution without sacrifices in dynamic range and spectral purity which are inherent in spectrometer-based designs. The use of an individual cosine collector simplifies optical calibrations and is optimized for use underwater. Surface radiometers are optimized for use in air. The internal data acquisition system incorporates the newest advances in dynamic range to allow instrument use over a greater range of ambient irradiances and turbidities. Together these enhancements make the PRR-800 ideal for high-speed measurements of ocean color throughout the euphotic zone. Sampling Strategy: Each sensor head contains an independent microprocessor and complete data acquisition system. These microprocessors sample synchronously and the individual modules compile data streams for transmission to the surface. Auxiliary Sensors: Auxiliary instruments that may be integrated include beam transmission, fluorometers, or other low-power, analog-output auxiliary sensors (consult factory). Deckbox: PRRs are equipped with a compact, water-resistant, rechargeable, battery-powered deckbox that provides computer interface and power distribution. Normal operating time between charges is approximately 18 hours with a 24-hour recharge time. Along with the deckbox, BSI also provides a 2-m RS-232 cable and an AC adapter/charger. Cables: 6-conductor, red, braided jacket Kevlar cable (PSC-805) for use with the PRR must be ordered separately. Custom lengths are available up to 350 m. Identical cable (PSC-810) is provided with the surface reference sensor in a standard 25-m length. As noted above, a 2 m RS-232 cable is also provided with the deckbox. 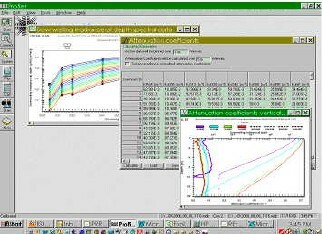 Software: BSI provides PROFILER, a Windows-based data acquisition and analysis software with the PRR. This software allows the host PC to acquire data and display it on a monitor. The software includes full graphical display with multiple user-selected channels. Data files are recorded in an ACCESS® database format. The profiler package includes user-specified configuration to speed profile setup. PRR-810 and PRR-2610 Surface Sensor: PRR systems may be fitted with a surface downwelling irradiance sensor designed to radiometrically match the array of the underwater sensor, but optimized for use in air. Operating together, the two instruments may be used to check for interference from shadows cast by boats or clouds and to assist in algorithm development, such as atmospheric corrections. Each PRR is extensively tested and characterized. Both graphically and numerically tabulated data are provided for each spectral channel. Test results for pressure and temperature calibrations are included. Calibration of radiance and irradiance is referenced to NIST Standards of Spectral Irradiance. Typical Performance: Terminal velocity and attitude within 2 m; free-fall orientation less than 2° tilt. Data Acquisition Subsystems: 26 channels per head with PGA and 16-bit A/D combination to yield 10 VFS and 1.3 µV LSB. Preamps designed to cover 10 decades of signal by manual or autor-anging. Downwelling irradiance sensor to match the array of the underwater sensor, but optimized for use in air.